Born in Philadelphia in 1874, Daniel George Coogan received his secondary education at Girard College. He attended Penn as a member of the Class of 1895. “Little Danny Coogan” was the nickname he acquired due to his small stature, but his talent and abilities were anything but little. A talented baseball player who could play a variety of positions, Coogan served as catcher on Penn’s 1892, 1893, and 1894 baseball teams. During the summers he played baseball in Cape May and Atlantic City. Coogan was a nineteen-year old college senior and captain of the 1895 Penn baseball team when he left Penn to join the Washington Senators, debuting on April 25, 1895. From 1896 to 1898 he played for Providence and then in 1900 for Rochester (both in the Eastern League); then with Cortland in 1900 and Utica in 1901 (both in the New York League); he finished his professional play with Louisville (American Association) in 1901 and then with Schenectady in 1902 and 1903. During these years he also coached at Virginia, Wesleyan, Episcopal Academy, and Union. 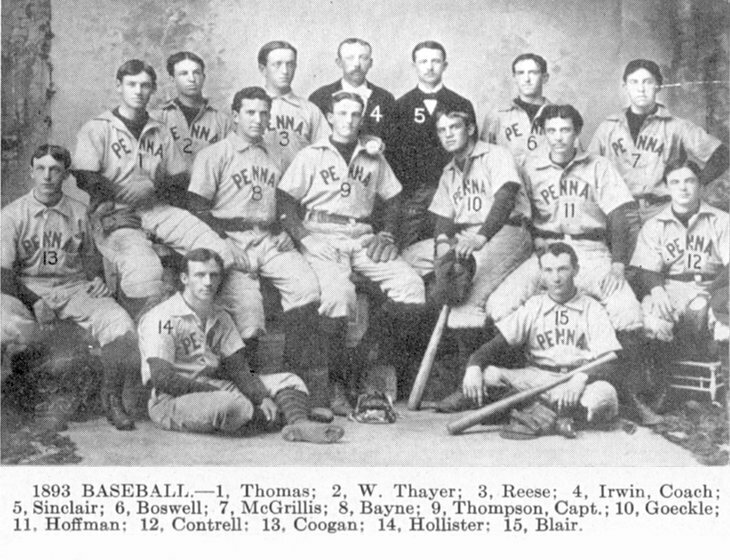 In 1904 Coogan returned to Penn to coach baseball, taking over from Roy Thomas and staying through 1906. He later moved on to coach at Cornell, Bowdoin, and Georgetown. Coogan later served in the Canadian Army as a physical director during World War I. He died in Philadelphia in 1942.